What to choose for the wedding dance: recording or live music? 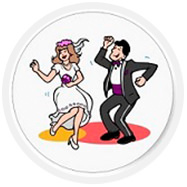 the Wedding dance of the newlyweds – the perfect ritual for the quality of execution which pair you need to consider everything, starting from clothes and finishing of each element of the choreography. It is extremely important in this case and to choose the right music for the dance, which usually becomes a favorite song the bride and groom or something that has become a classic wedding song. Therefore, it is not less important that who will be performing the music for the wedding dance. And choose, usually have between electronic player, capable of playing the desired entry with digital media, and musicians playing live. Latest fashion wedding direction was the performance of songs for a wedding dance cover bands that don't just play them live, but also create an individual sound. And not to make the wrong choice, the newlyweds need to consider the advantages and disadvantages of all options. to Record your favorite song on any modern digital media and to allow sound through the speakers is not only easy, but also easily accessible. You do not need to worry about the quality of music and the preservation of special effects. If during the execution of the dance couple will forget some move or you'll ruin the rhythm, the player will stop itself and does not slow down the music playback. Of course, if the music is following a professional DJ or a sound engineer, it is possible that complicated the situation will be corrected. However, this risk still exists. "Dead sound" of recorded music will be a good design, but will not be able to create the necessary magical atmosphere that makes the dance unforgettable, not only for newlyweds but also for their guests. However, despite the disadvantages, many people prefer this option as it is most cheap than an order of live music. to give only live music, but due to the fact that a live performance allows you to upgrade the sound, creating something truly unique. In addition, in the event of an emergency in the dance musicians will be able to easily fix any mishap, changing the arrangement or adding improvisation. This is a very important plus for all who want a perfect wedding. But the main difficulty that arises among those who want to perform the dance to the live music, it is a necessity in joint rehearsals with musicians. Moreover, the number of rehearsals depends not only on the complexity of a choreographed dance, but also on the characteristics of the chosen design and skill of the musicians themselves. Therefore, for proper selection of a musical ensemble, it is necessary to consider the particularities of the music itself. And because today's newlyweds are increasingly choosing songs from the styles of jazz, pop, rock and chanson, which are included in the repertoire of most cover bands, the wedding are invited to attend these groups. Thus, one can create high-quality music for dancing to modern music. the Repertoire of cover bands Orange VINIL includes the most popular wedding songs. In addition, musicians are always ready to play for live wedding dance to almost any song suggested by the newlyweds. Wedding Agency or independent organization of weddings?